Mutschler Edge Technologies designs and builds a line of brush type edge prep equipment for all types of cutting tools. Started in 2008 and drawing from a history of brush deburring machine design and manufacturing, we produced our first edge prep machines in 1995 under the OLS brand. This machine is in operation today and is focused on carbide inserts. Our many years of experience in applying brushes to create a desired result have driven the design and function of our equipment. MET is a family company held by Eric, Chris and Adam Mutschler. The company operates in Cleveland, Ohio in a 20,000 sq ft. building. It operates alongside Cleveland Deburring Machine Company which focuses on custom and standard brush deburring equipment. We have been in the brushing business since 1993 and have produced thousands of machines over the years. To produce equipment to allow the end user to produce whatever edge prep result that they are seeking. Our expertise is in the robust and dependable performance the MET-2, MET-4 and MET-10 machines will provide. The levels of machines allow for a very basic approach to a complex and very unique recipe to achieve your specific edge prep. As we have learned, there are many theories and preferences in what tool prep works best and we have learned that testing is a huge part of this development. Any of our machines are fully open, in plain view, with variable controls to create virtually any shape/size you require. Our goal is to provide this tool to you. MET-2: Entry level, cost effective machine that is capable of round tools, drills, end mills, reamers, hobs, etc. 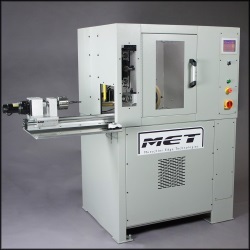 The MET-2 operates with a dc driven system and has full capability of motion to create all types of tip and OD edge prep results. MET-4: Servo system with synchronized axes to allow for helix polishing. Same motion as the MET-2 but faster and more capable of complex shapes. Polishing flute, tapered end mills, step drills, etc. The MET-4 can also be equipped with a robot loading system for a hands off system. MET-10: Insert machine with dual spindles and brushes. Manual load and capable of complex shapes. Uses our Tool Wizard feature for easy set up. Brushes: We support your needs by providing excellent options for brushes. These are crucial to the performance of the machine. We design and have built our own diamond brushes which outperform the currently available products on the market. We also provide silicon carbide and ceramic brushes in various grits to keep your cost per piece manageable. Support: Our team will install your machine and train your employees with the latest techniques to help launch your edge prep program.